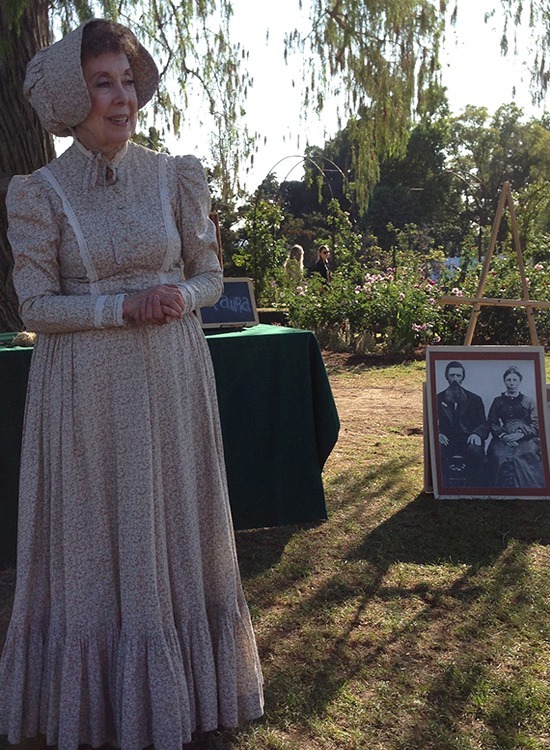 When Judith Helton goes to work she literally steps into the past. Since 1976 she has written, costumed, and performed four one-woman shows, each relating to an actual historic figure. Her performances now number in the thousands for student and adult audiences. Judith is on the roster of the Music Center on Tour and the Arts Teach Program at the Segerstrom Center for the Arts. In 1996, she was honored with a “Lifetime Achievement Award” by the Professional Artists in Schools Awards (PASA), which recognizes performers who are dedicated to bringing the arts to children in Los Angeles-area schools. 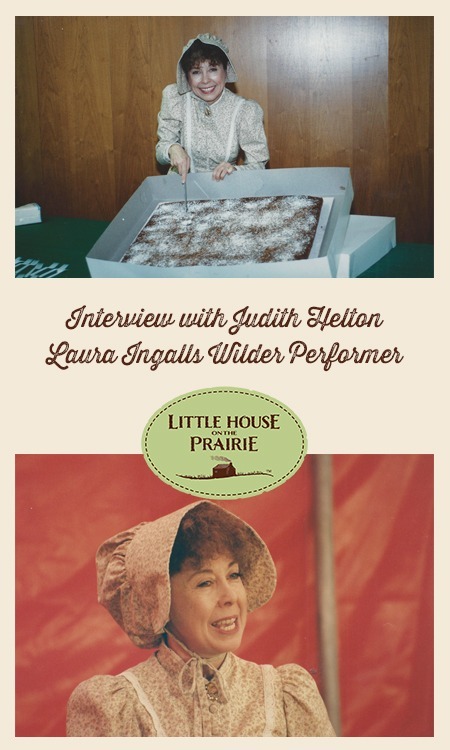 We thought our readers would love to hear about Judith’s experiences bringing Laura Ingalls Wilder to life on the stage. Q: Please tell us about your background, your interest in Laura Ingalls Wilder, and your one-woman show. I’m an actress in Los Angeles who does NOT do film or television. My acting experience is and always has been theatre, having a rapport with a live audience. I majored in Theatre at Southern Illinois University. By the time I came to create my one-woman shows I had already performed professionally in regional theatre, summer stock, touring, dinner theater and a Shakespeare festival. I draw on all of that experience in the work I’m doing now, becoming famous women from history, including Laura Ingalls Wilder. In 1976, the year of the Bicentennial, I began with my first one-woman show “Abigail Adams: Revolutionary Woman”, which I continue to do to this day. I followed this with a gold rush program, “Lotta Crabtree”, who was a famous child entertainer in California. I now had characters from the East Coast and West Coast, and hoped to find someone from the Midwest, closer to my roots going back five generations in Southern Illinois. On a visit to a library in 1988, I looked at the biography section in the children’s room and found a book about Laura Ingalls Wilder. In an instant I knew I had found my next show. I had not read the Little House books as a child, so discovering them as an adult was very interesting. As I read, I could see Laura’s experiences through her adult eyes looking back and describing a fascinating childhood. The following year I added another show about writer and painter, Beatrix Potter. After getting permission to use Little House material covered by copyright, I began putting together a narrative arc through the books. I knew I couldn’t just read from them, so I started the long task of memorizing dozens of stories word for word. Since I stay in character and answer questions from the audience, I had to research and commit to memory numerous names, facts and dates. 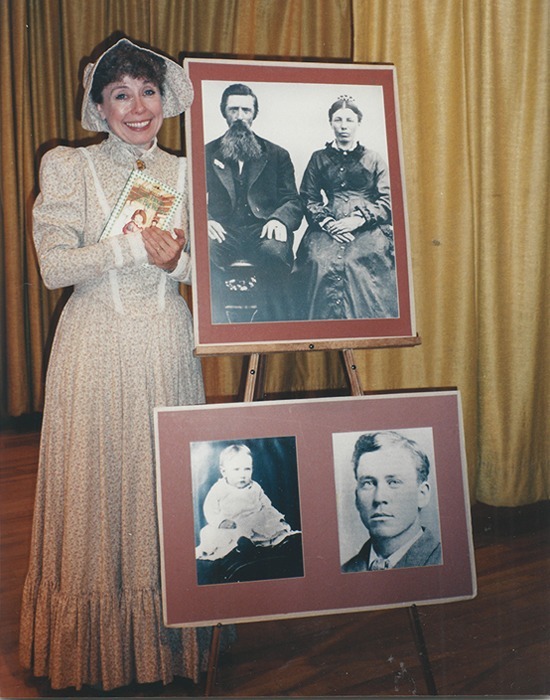 I act in character and to add to the visuals I created blow-up pictures of the Ingalls family, and gathered artifacts mentioned in the books such as a coffee grinder, hay twist and oil lamp. I also included a circle dance with children into my show, as described in Little House in the Big Woods. 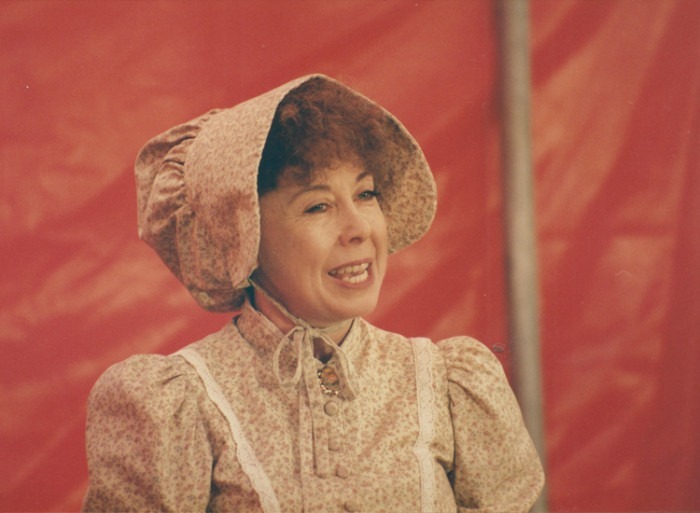 My show, “Laura Ingalls Wilder”, has now been performed thousands of times in schools, clubs, libraries, museums and private homes and is still a joy to perform. Children and adults alike respond to these books which speak not only of times gone by, but for all time. Q: You have done a lot of research about Laura Ingalls Wilder. Please recommend a few books about Laura for interested adults. I have a shelf full of books about Laura. To select only a few is difficult, but I would have to say that Laura’s recently annotated autobiography Pioneer Girl, edited by Pamela Smith Hill, is a treasure trove of information about both Laura and her creative process. The footnotes would make up a book by themselves. She has certainly done her research! I also found a lot of good information in Pamela Smith Hills’ biography Laura Ingalls Wilder: A Writer’s Life. She goes deeply into her subject to find nuggets of information that give new meaning to the facts we know. Of course William Anderson’s pamphlets and books are a great resource. A Little House Reader includes Laura’s writings as a journalist. This gives us Laura the writer unfiltered by the editing and rewriting that went into her books. We also can read some of her poetry, which often explores her love of nature and the land. Anderson’s book The Little House Guidebook provides a tour of the home sites which often seem like characters themselves in the books. The excellent photography by Leslie A. Kelly gives us a look at the places so dear to Laura’s heart and are so much a part of her story. Finally, Little House in the Ozarks: The Rediscovered Writings, edited by Stephen W. Hines, lets us see Laura’s newspaper articles more fully, written well before her books. It has the homespun wisdom that she would later bring to her books, how the love of simple things can build a full life. Q: Do you have a favorite Little House book or Laura Ingalls Wilder quote? Judith performs in the rose garden of The Huntington in San Marino, California November 14, 2015. Q: How many different Laura costumes do you have? Do you have any special accessories you like to wear? Q: How did you originally prepare for your role as Laura? What do you do to get into character? For me, a big part of creating characters is discovering how they talk. Fortunately, we have a recording that Laura made in Mansfield, Missouri, at her local library when she was in her 80s. I have listened to it so many times I can say the words with her. Of course I first read and reread all the Little House books and every book I could find about Laura. As part of my research I traveled to Walnut Grove, Minnesota, De Smet, South Dakota, and Mansfield, Missouri where I met people who remembered Laura. I was pleased to be asked to perform at Rocky Ridge Farm as Laura in 1994 on the 100th anniversary of the Wilders’ arrival in Mansfield. I have also performed as Laura at Almanzo’s home near Malone, New York, telling stories that took place on that very farm. Being in the actual locations where Laura lived and traveled gave me information I couldn’t get from a book. In Walnut Grove by the old dugout a large grasshopper landed on my arm. I then understood the creepy feeling Laura must have had, multiplied by thousands of times what I felt, when grasshoppers rained from the sky. One very interesting and meaningful thing that happened in my journey with Laura was meeting Clara Webber who started the Laura Ingalls Wilder Room at the Pomona Public Library. We became friends, and she told me so many wonderful stories about her correspondence with Laura and her visit with Rose. In fact, Clara Webber named the children’s room at the Pomona Public Library for Laura and received the original handwritten manuscript of Little Town on the Prairie from Laura for the library. I recorded her telling these stories in 1992 and presented a copy of the recording to the Library and sent one to William Anderson who has written so many informative books and pamphlets about her. Judith Helton introducing some of the Ingalls and Wilder family members. Q: We understand that you do a Q&A session in character. What types of questions do people want to know most about Laura? Often people want to know more about Laura’s family, in particular about Mary. I tell how Laura became eyes for her sister who went blind, describing things so that Mary could “see” them too. “Laura, you paint pictures with words.” I feel this later became an important part of Laura’s skill as a writer, making the reader “see” the image she wrote about through her use of descriptive words. And I think she expanded this technique. We all experience the world through our senses, and I believe this is a reason her work is so accessible in all cultures. An example from The Long Winter: “The sunset was shining on the western window and flooding the whole room with golden light while they leveled the sweet-smelling, crackling hay in the straw ticks and laid the featherbed on top and stroked them softly smooth.” Sight, sound, hearing and touch all in one sentence. 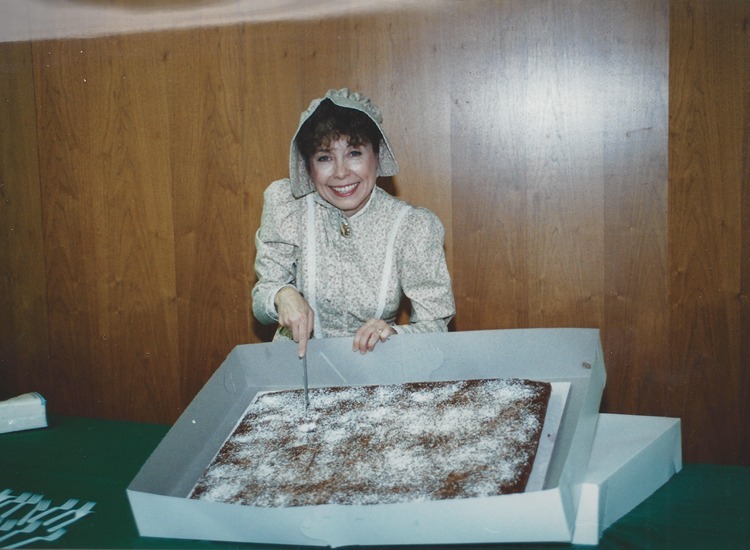 Judith Helton celebrating Laura’s birthday at the Burbank Central Library in Burbank, California. Q: Have you seen a resurgence of interest in Laura Ingalls Wilder in recent years, particularly with the publication of “Pioneer Girl: The Annotated Autobiography“? I don’t think the interest has ever waned. Pioneer Girl has been a great addition to our knowledge and understanding of the beginning of the Little House books. I was not alone in eagerly awaiting its publication and it didn’t disappoint. I thought I knew a lot, but I learned so much more. Also, The Legacy of Laura Ingalls Wilder DVD adds another dimension to Laura’s story. Dean Butler, who played Almanzo on the TV series, did a wonderful job of directing and narrating this documentary. I had the privilege of meeting him once at a show I did. 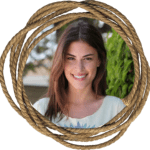 Pioneer Girl, published in 2014, and The Legacy of Laura Ingalls Wilder documentary, released in 2015, have certainly contributed to the popularity Laura still enjoys. For my part, it is seldom that I do my show in a regular theatre with a paying audience. Well, in the summer of 2015, the Museum on Main sold out my “An Evening with Laura Ingalls Wilder” performance at the Firehouse Arts Center in Pleasanton, California. A very pleasant surprise! It is clear to me that the years have not diminished Laura’s place in people’s hearts. 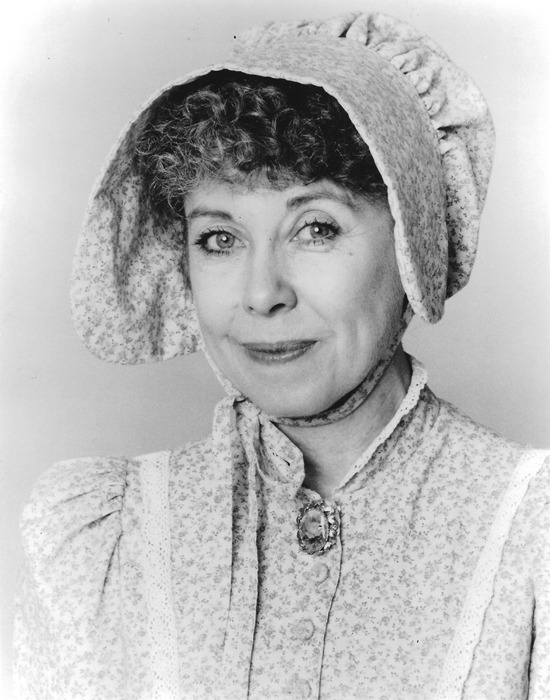 Judith Helton in character as Laura Ingalls Wilder. Q: We understand you also perform as Abigail Adams, Lotta Crabtree, and Beatrix Potter. Are there any similarities between these characters and Laura Ingalls Wilder? In thinking about this question I realized that each of my characters lived life to the fullest and in so doing came to represent their own time and place: Abigail Adams (The American Revolution), Lotta Crabtree (the California Gold Rush), Beatrix Potter (Victorian England) and Laura Ingalls Wilder (the Settlement of the Prairie). Laura summed this up beautifully when she wrote “I began to think what a wonderful childhood I had had. How I had seen the whole frontier, the woods, the Indian country of the great plains, the frontier towns, the building of the railroads in wild, unsettled country, homesteading and farmers coming in to take possession…Then I understood that in my own life I represented a whole period of American History.” I’ve always been fascinated by history. Unfortunately there is no such thing as a time machine. But the life of each of my characters, these historic women, became a lens into another era and let me see and vicariously experience the past in a unique way. In conclusion I want to say I’ve encountered so many wonderful and interesting people through Laura Ingalls Wilder, individuals that I probably would have never met otherwise. It’s my belief that Laura brings together people who should know each other. If you agree with Judith, be sure to subscribe to our Little House on the Prairie Newsletter, so we can bring you information about and exclusive interviews with the interesting people in this community.